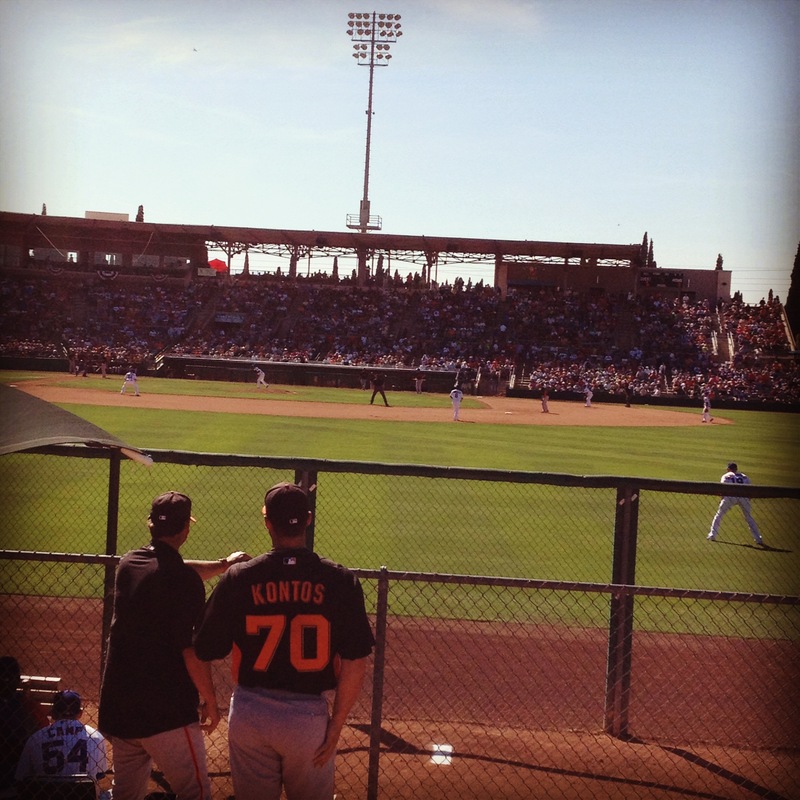 As a diehard, life-long Giants fan, visiting Spring Training has always been on my bucket list. Everyone always says how memorable and amazing Spring Training is, and I finally got my chance to go this year. I just graduated from UC Davis and finished my last final on Saturday the 23rd, so I figured this would be the perfect opportunity to catch the end of Spring Training. My dad and I left Sunday the 24th around 12, and after a brief night in Blythe, CA, we ended up in Scottsdale, AZ Monday morning before the Giants game at Hohokam Park in Mesa, AZ against the Cubs. As soon as we parked the car, I could already feel the excitement and the Giants spirit. I could hear the “Let’s Go Giants!” cheers all the way from the parking lot. We arrived to the game an hour early, and there were already a ton of fans there. This game was a sellout at Hohokam Park (13,374 people were in attendance), and the crowd was pretty evenly divided between Cubs and Giants fans. We sat on the lawn in the outfield for this game, and it definitely felt like the atmosphere in the bleachers at AT&T Park. 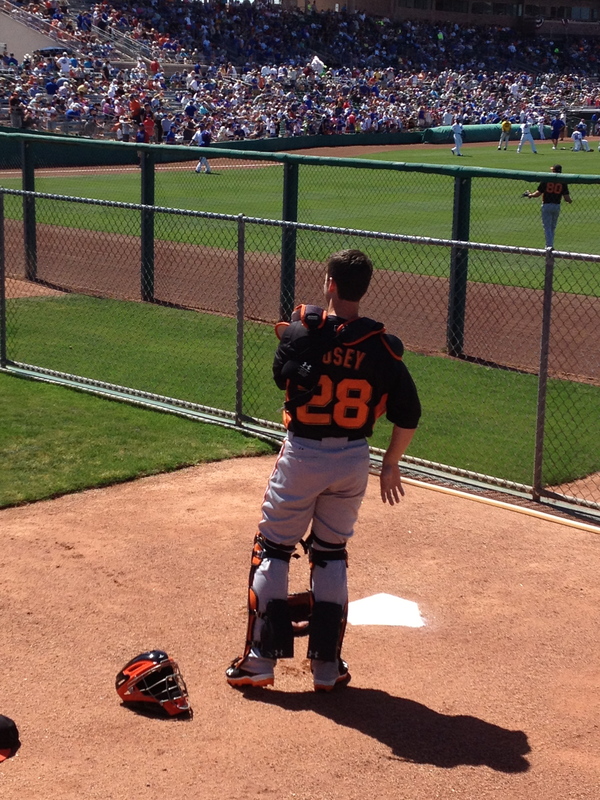 We were right near the Giants bullpen, so we got an up-close look at Vogelsong warming up and Buster catching. 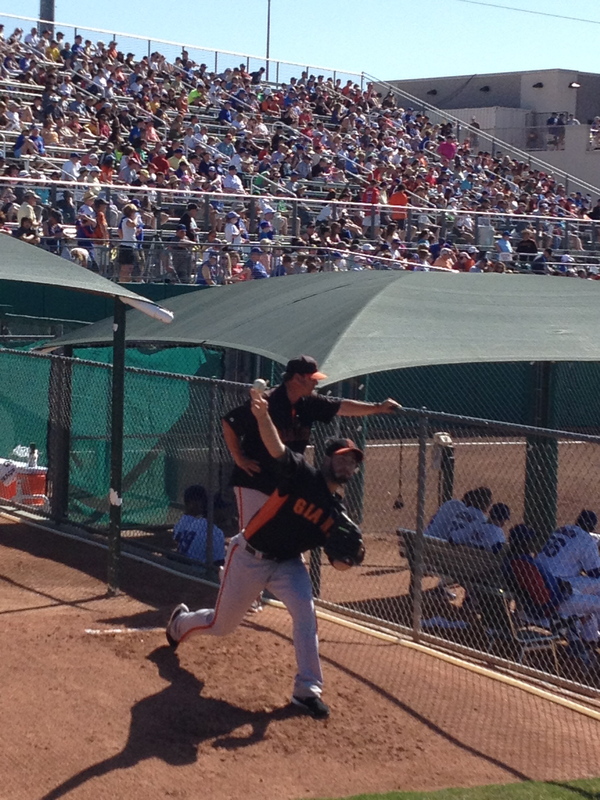 Vogelsong looked okay in his last Spring Training outing. He allowed six hits, two walks, three strikeouts, and three runs in his six innings. However, the Giants’ offense exploded for nine runs off of three hits from Buster Posey and Joaquin Arias, and a two-run double from Andres Torres. Angel Pagan and Nick Noonan also each had two hits. Noonan certainly bolstered his case to make the team as an extra utility infielder with his two doubles and stellar defense. 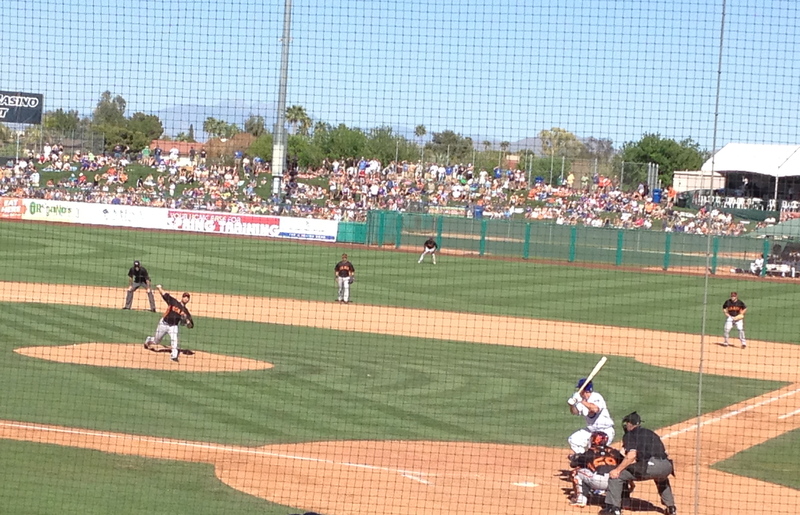 Kontos, Lopez, and Romo pitched in relief as well, and they all looked ready for the regular season to start. The Giants won 9-3. 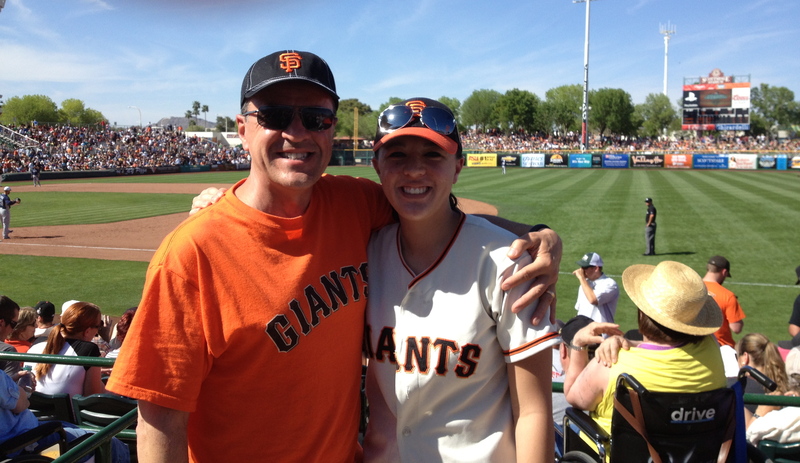 My dad and I were also able to go see Tuesday’s game at Scottsdale Stadium against the Padres. 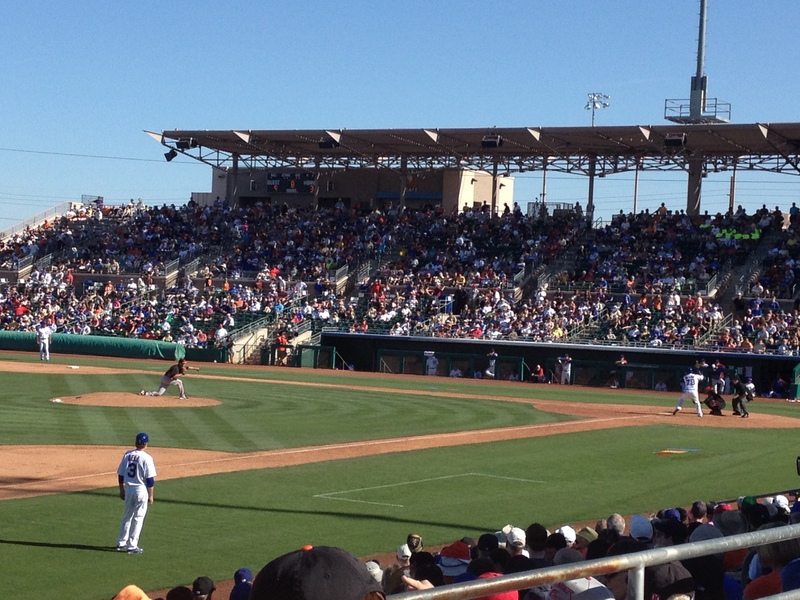 Scottsdale Stadium looks and feels almost like a mini-AT&T Park. We arrived an hour and a half before the game, and, again, there were a lot of fans there already. Unlike the last game, it seemed like 90% of the people in attendance at Tuesday’s game were Giants fans. I didn’t see many Padres fans at all. In fact, I saw more Angels and Dodgers fans, and even a couple Yankees and Royals fans. We sat along the first base line at this game, and fans were lined up shoulder-to-shoulder to get autographs from any Giants player they could. Being able to watch part of batting practice and pre-game warmups so close to the field for the first time was amazing in itself. But seeing how the some of the Giants, like Hunter Pence, would interact with the fans before the game was truly incredible. These little moments were why Spring Training was so memorable. With Sandoval still out with a nagging elbow injury and with Hector Sanchez still out with shoulder and calf injuries, Arias and Quiroz filled in at 3B and catcher, respectively. Other than that, this lineup was pretty close to the everyday lineup that Bruce Bochy will use in the regular season when Posey is taking a day off from catching. Matt Cain was supposed to start this game, but in order to preserve his pitch count and hide him from a division foe, the Giants started Petit instead, and Matt Cain started a simulated game earlier in the day. Brandon Belt continued his incredible spring with three hits in four at bats, bringing his Spring Training batting average to .453 and .619 in his past six games. Brandon Crawford also had a great game going 2-4 including an RBI-double. His Spring Training batting average is now .365. Hunter Pence had a stellar game as well with a tie-breaking, two-run double, which brought his batting average to .361 in Spring Training. Petit went four innings giving up only four hits and one run, while walking two and striking out two. Mijares, Affeldt, Casilla, Proctor, and Machi all got in some relief work, and Casilla was the only one that allowed a run in the remaining innings. Mijares looked much better in this outing after having a bumpy first outing since an injury sidelined him, and Affeldt looked superb. The Giants won 4-2. 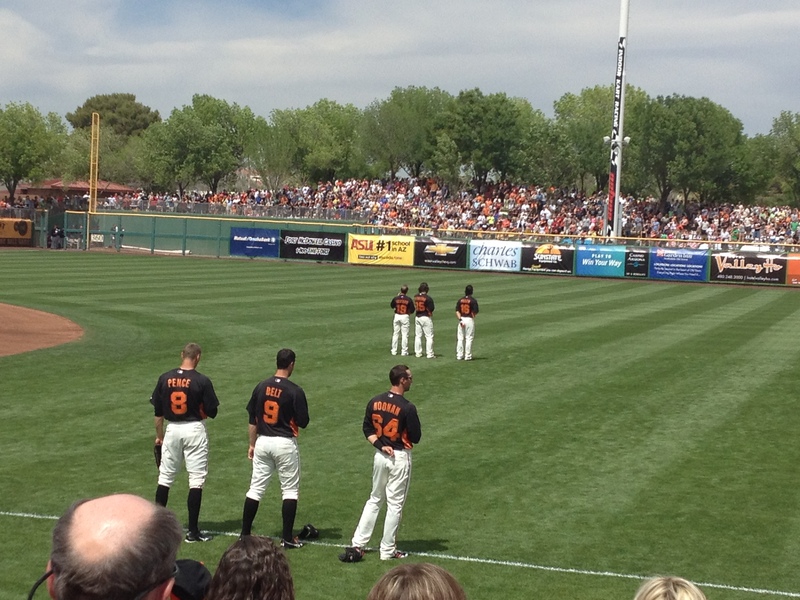 Overall, my first Spring Training experience was unforgettable. I can now see why people always say that if you’re a Giants fan, you have to go to Spring Training at some point in your life. Some people might not ever get another chance other than Spring Training to see the game so close, see the players so close, and possibly get some autographs and conversation from the players. 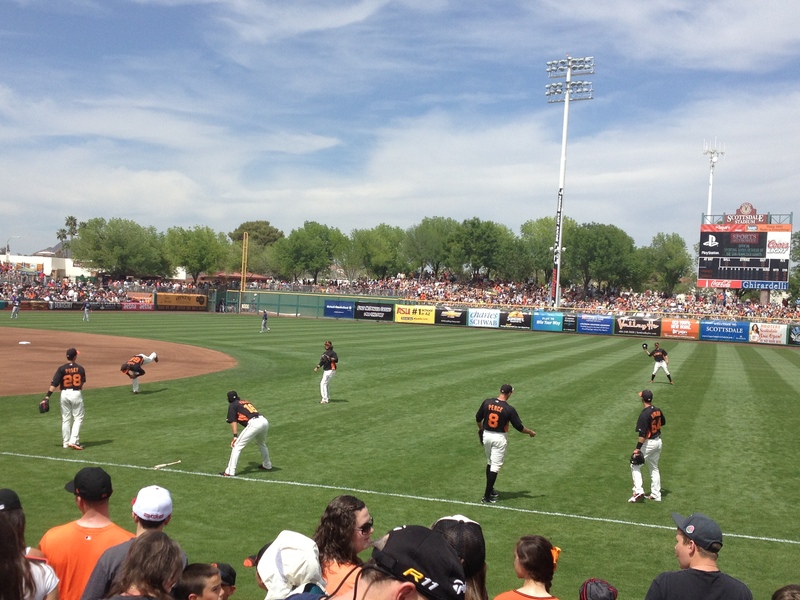 Whether the game’s at Scottsdale Stadium or at another team’s home stadium in Spring Training, the atmosphere is incredible and, generally, more intimate than a normal MLB stadium. Like I mentioned earlier, one of my favorite parts of Spring Training was seeing the players interact with fans, whether it was giving them an autograph, saying hi as they entered the field, waving, etc. Since the atmosphere of Spring Training is more relaxed and casual than the regular season, it’s great to see the players more interactive and aware of the fans, and it really seems like they made the extra effort to connect with fans, even if it just waving. 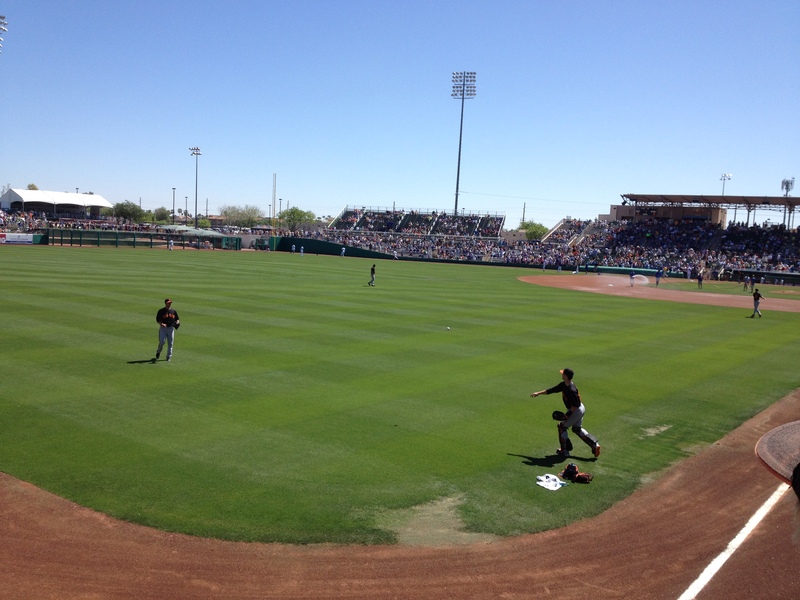 I’d love to go back to Spring Training next year. 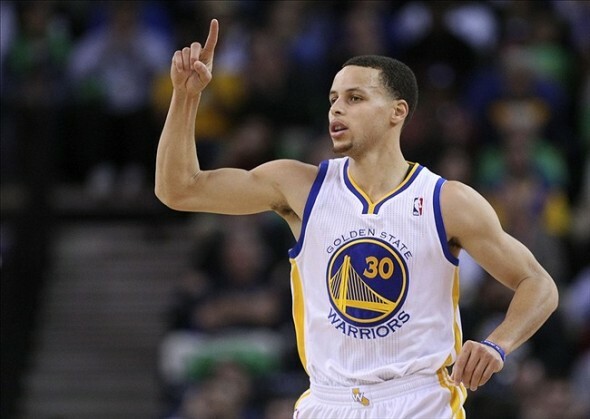 As a sports fan, it was one of the best experiences I’ve ever had in my life. As a college graduate, it was a great way to celebrate graduation through my love of sports. As a daughter, it was very special for me to be able to experience something as unforgettable this with my dad. Spring Training was even more memorable that I thought it would be, and I hope going to Spring Training becomes a tradition in the Pilloton household.